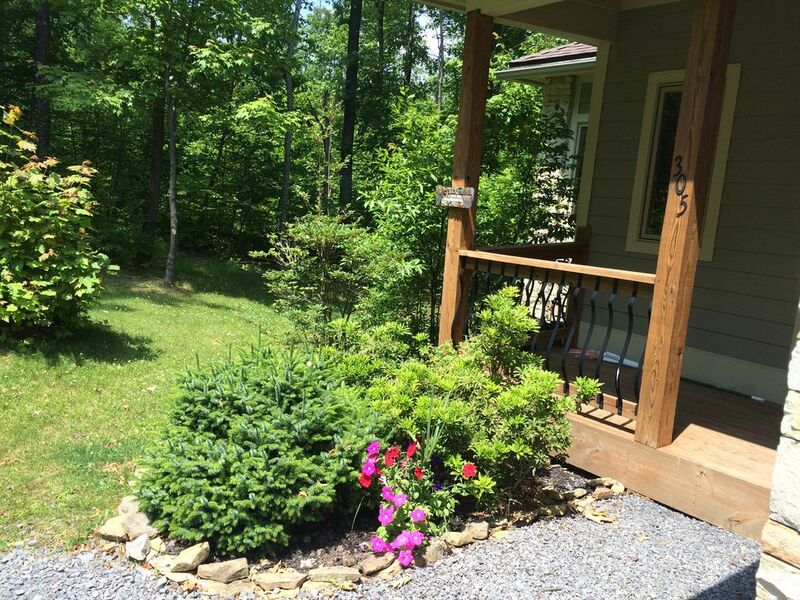 Gorgeous condo just mins to Deep Creek Lake, skiing, shopping, & restaurants. My in- laws were named Napoleon & Josephine. They had a little cabin in the woods called Nap Awhile where my father-in-law loved to go to fish & relax. So our Nap Awhile is named to honor & remember our beloved Napoleon & Josephine. My mother's initials are nap and she loves bright colorful costume jewelry so the sign and the name were a natural for us. It is so peaceful, tranquil & lovely. You can nap or read in the quiet surrounding woods yet you are just minutes away from all the activities & attractions that draw people to the Deep Creek area season after season. All baths have tubs, private baths have double sinks, shared bath has single sink. All towels furnished, including towels for hot tub. Towels provided, to include hot tub towels. State-of-the-art hot tub with fountain & lights. Nap Awhile far exceeded our expectations. It was beautiful, spacious and clean. The house was perfect for our two families getaway. Location was great and would definitely recommend staying here when visiting Deep Creek. I thank you for a very good Thanksgiving holiday. The house was very clean and very well stocked with necessities. The only problem was with the weather it could have been a little warmer and drier. I hope we left it in the same condition that we found it in. The location of this rental is convenient. The kitchen is well-stocked. We cooked-in every night. The condo is new, updated, and clean. I definitely recommend. Thank you so much for taking the time to write the review. It means a lot to us and definitely helps future renters. We work very hard to keep the property clean and well maintained so that our guests feel right at home. Again, thank you for your time and kind comments. The house worked great for our group. We have three families and four kids. The three master bedrooms were ideal for the parents and the lower level was perfect for the kids. The main level floor plan is open and spacious for this size group. Dining seating for 10 and open site lines from kitchen to the family room sitting area. The kitchen is well stocked and had everything we needed for making several meals in the morning and evenings. A couple of little things could enhance the house. An extra blanket in each bedroom for those who prefer would be nice. There is no roll-away bed as advertised. There is no TV on the main level unless you count the 5 inch under counter TV in the kitchen. We did not mind not having it but we expected one. The outside grill was out of propane gas and the extra tank in the garage was also empty so we refilled one for $25 on our own. The garbage disposal in the kitchen is broken. We tried to reset and use wrench to fix it but nothing was working. We will likely be back next year for more skiing! The property was comfortable and very clean. We had plenty of space for my family. This was our first visit to the Deep Creek area and it was delightful. We enjoyed the passes to the state parks. We visited nearby museums and enjoyed the shopping. Our family time was really enjoyable and comfortable. My family included our married kids with two grandchildren and our aunt, as well as myself and my husband. There was plenty of room for us all from toddlers to grandparents. We enjoyed family dinners and found the kitchen well stocked and easy to use. Everyone loved the outdoor deck, and we also had family movie night downstairs. The ping pong table got a workout as well. Thanks for a wonderful vacation! Thank you so much for your kind words. I am so pleased you enjoyed your stay and the house. Includes 2 passes for vehicles to enter all of Maryland's state parks. Enjoy all the outdoor amenities the Deep Creek area has to offer minutes away including the beach at Deep Creek State Park and Swallow Falls. Near to Deep Creek Lake and Wisp Ski Resort.